Things I have witnessed since moving to Turin. | Where's Zoe now? Things I have witnessed since moving to Turin. This afternoon, I’m leaving on a work trip to Lake Como (sometimes you have to make sacrifices for your career, you know?) so just a quick listicle type post for today. The other day, 4 people in period costume were leaving Porta Nuova metro station the same time as me. One of the women was wearing a skirt with a bustle and she had to turn sideways to get through the fare gate. As I got to street level, I discovered they were part of a parade. Those skirts weren’t designed with metro turnstiles in mind. No idea what the occasion was, perhaps the feast of St John? 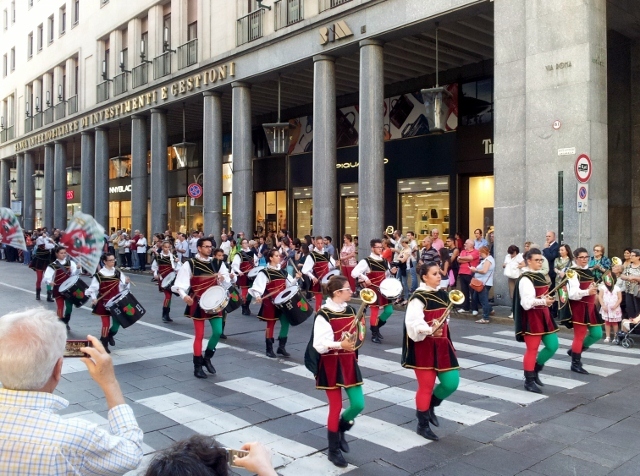 One of several marching bands I passed on via Roma. Two nuns in a Smart car, reversing against traffic to let a bus out of the bus stop. A guy busking with an accordion in the city centre playing “Bella Ciao”, which wouldn’t be so notable except that every morning I walk past, he’s there, and every time he has been playing “Bella Ciao”. I don’t know if he knows any other songs. Whenever it rains, there will inevitably be at least one cyclist out, holding an umbrella with one hand and steering with the other. This never fails to make me nervous. A group of Juventus fans lighting a flare, after Juve lost the final of the Champions League. I suppose it would be a shame to waste a perfectly good flare over a technicality like your team not actually winning. 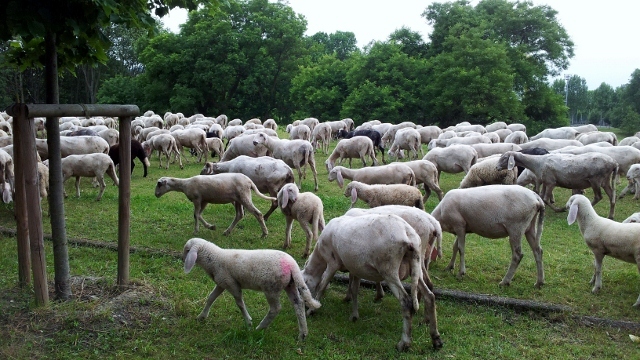 A flock of sheep grazing in a city park. Baaaa… only a couple of kms from the centre of town. A Landrover with an Italian family crammed in. The father, in the driver’s seat, was smoking a pipe. A group of French tourists asking some locals in broken French-Italian how to get to Porta Palazzo market, and the locals turning to each other after the French have left, asking, “Why on earth would they want to go there? ?” I have seen exchange this several times; the tourists are always French. This entry was posted in Italy, Living in Turin and tagged cultural differences, expat, living abroad on June 28, 2015 by Where's Zoe Now?. I believe that terrific mural was made by eric il cane: http://www.ericailcane.org/ . 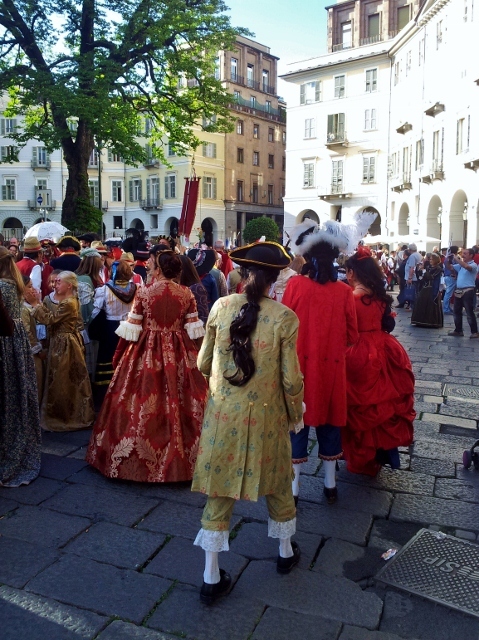 Yes, it was a corteo for the Feast of St. John the Baptist, patron saint of Torino. They participate by neighbourhood. We have some friends that do historical costume and they were probably part of the crowd! The sheep were in parco Colletta, where the Dora and the Po meet. Apparently it’s a scheme where people can bring their sheep to graze and save the city money on mowing the grass – not sure it would work in parco Valentino, though!